Note 4/9/2018: VeteransHealthBlog.Com is in Re-Design. Watch for changes. In 1968 Donald Parent came home from the War in Vietnam. He had married his High School Sweetheart in Hawaii on his six-day R&R Leave. With a new wife and an Honorable Discharge, he tried to put his life back together. As an 11-B-10 Light Infantryman, he received multiple Purple Hearts. He came home addicted to the Adrenalin Rushes that a warzone supplied in spades. He also became addicted to drugs and alcohol which is extremely common for our returning vets. PTSD was not an acronym yet. His wife received her own form of PTSD by Contact trying to live with him and help any way she could. Over the next fifty plus years, he became a Researcher in order to save both of their lives. They now have two daughters and three granddaughters. They just celebrated their fiftieth anniversary. Does PTSD and the aftermath of War still affect them? YES! Through his Books, Web sites, and Blogs he continues to learn and help teach the younger vets and their families. Don Parent has met many Writers, Doctors, and Researchers over the years in his quest to understand what lays waiting in the wake of all wars. It is in the middle of its Fourth Edition rewrite. This Blog is his way of spreading the word on what the everyday GI Joe Veteran needs to watch out for on their way to a healthy future. 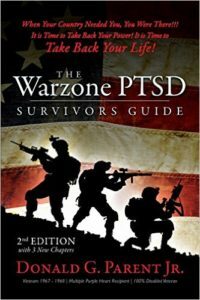 Your best place to learn is by interacting with the thousands of veterans that have struggled with the same things you may be dealing with right now. That is simply not true. With today’s breakthroughs in science, harvesting and stabilization techniques Ancient Health Care is being revisited with amazing results. Things that worked for many thousands of years are pouring back and kicking Toxic Drugs to the curb. Big Pharma and their Opioids are rapidly losing their luster due to the millions of pills flooding into our cities and destroying lives. 20,827,260 Number of prescription painkiller pills sent to two pharmacies in a West Virginia town of about 3000 people by out-of-state drug companies from 2006 to 2016 according to the Committee on Energy and Commerce in the U.S. House of Representatives!! !